My first ten days in the hospital were spent in the vip ward. Most of this time I was flat on my back feeling paralyzed by the pain from my spinal headache. I memorized the entire ceiling. There were some lonely times that got me a bit blue, but I was lucky to have a lot of wonderful people by my side. At times I got annoyed with some of them, but they gave me friendship and lots of laughs that got me through the long days. There were many fun times, which included getting to hold newborn babies. I would hear them crying and ask the nurses if they could bring it to me. I was sort of joking the first time, but found out soon they were up for it. The family of the babies would come in and look at me as I looked at their baby. I spent the first ten days in the VIP ward. The room was way bigger than anything I needed, but they wanted me to have it. 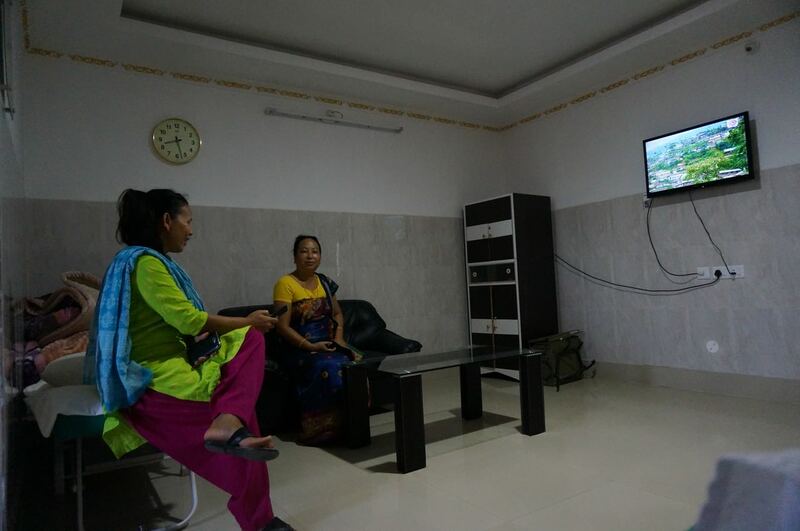 A large flat screen TV didn’t get much use except for my guests watching loud dramatic Indian Soaps and news. A window with bars looked out over garbage littered fields, partially built houses, and tarp shelters. During the time I was there, I watched the season chance and the rains begin. There was a living room area where all the visitors and families would hang out along with a small bed for my police guards to stay the night in. I never understood why they insisted on me having them. There were a few of them on rounds who would take turns spending the night. They were all really nice guys, but spoke only a smidgin of english. Having a conversation was very difficult so mostly all we could do is smile, share snacks, and take photos together. I look back and have good memories from these friendly policemen, but at the time I grew to not like it. When I was feeling crapy or in pain, the last thing I wanted was a room full of people talking loudly and pestering me with questions. The night time was the worst. Sometimes people would come in late at night and just hang out watching loud tv. I felt like a sick dog who just wants to crawl under the porch away from everything. I tried telling them that I didn’t need any police to stay with me, but every night they showed up right on time. I felt really bad one morning when someone told me the officer had slept in the hallway the night before. It was his first night and apparently was embarrassed that he couldn’t speak english. It was a strange thing seeing these Indian police officers being so nice and timid with me. 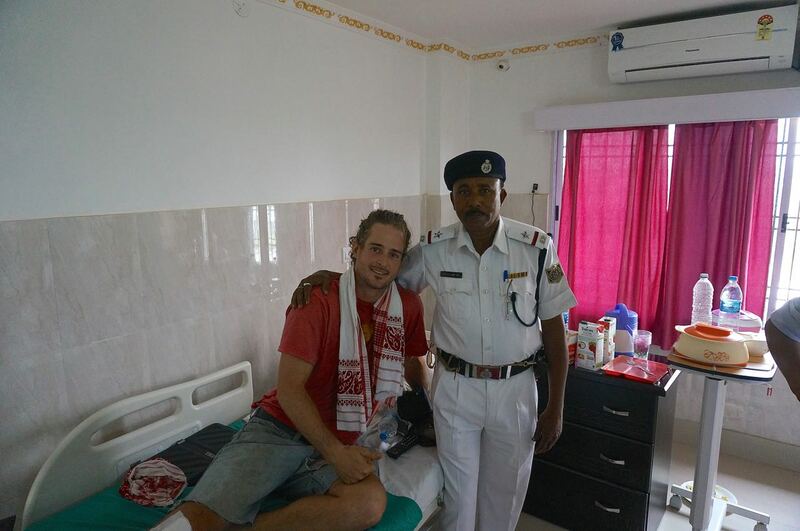 Indian police can be a bit surely and not too nice to the locals. I’ve seen multiple times people being beaten up, verbally abused, and intimidated by officers who seem to be on a power trip. Many of the traffic police at intersections carry wooden sticks that they aren’t afraid to use on people. In the hospital setting, they all seemed so sweet. I made nice friendships with a few of them, but there was one who I’ll always remember. He was the first officer I encountered at the hospital and he had the best smile. When I was in the ER being worked on he looked like a little kid full of mischief. Once I was good and high from the pain killers he was tickling my toes with his keys. He would look in the wound they were working on and then look at me with a look not hiding how gross it looked. The last name on his badge was Ali, so that became his name from then on out. He didn’t speak a word of english, but we had some kind of understanding. We would just look at each other and start laughing. He always made fun of me and did impressions of how crazy I was acting when they brought me in. He came everyday just to say hi and see how I was doing. Of anybody that came to visit me during those two weeks, I was always most excited when he walked through the door. He was the officer who chased down the driver of the truck and was proud to have arrested him. The family of the truck driver became my caregivers and brought me breakfast, lunch, dinner, and anything else I needed. It was almost always home cooked Indian food. I could never keep track of who was who. They had sisters, brothers, cousins, nephews, uncles, grandparents, and every form of family members come through. I never really knew though because in that part of India all guys are referred to as brother and girls as sister. In the beginning I was loving all the home cooked Indian food. Fresh roti, curries, and rice, but then it wore on me. When i developed the spinal headache, the pain made me nauseous for a lot day and it was tough to choke down any food. After a few days of trying to force the food down it got really tough. I lost my appetite for a week and just the smell of Indian food made me feel sick. I think I started relating the food with the pain. The ladies of the family were really worried by this and were constantly trying to feed me. The doctors told me they were worried about how much weight I was losing, but I just couldn’t handle any more Indian food. The first few days I was an animal scarfing down anything they put in front of me, but eventually barely picked at it. The ladies were so frustrated by it and would get mad at my doctors, like they had caused it. In Assam, rice is the most important food in their lives. Every meal involves rice and is a must. I got into arguments with them over the stupid stuff. I stopped eating any rice they brought, which freaked them out. They said that if I didn’t eat rice with the curry I wouldn’t be able to digest anything properly. I felt like a four year old at times arguing about my meals with them. They had a lot of ideas about how to eat that i didn’t like. One time someone brought me a nice ice cold coke, but they gave me a separate warm one to let the cold one warm up. They said if I drank the cold one I would end up getting sick because the cold is bad for the body. They would treat me like a baby and want to do everything for me, like I was incapable of dealing with anything except putting the fork to my mouth. Like the police, looking back I’m grateful for their help and support through that time, but while it was going on I had times I wanted to scream. I wanted Italian food so bad and especially lasagna, but nobody knew what that was. They tracked down some pizza for me that ended up being bread with shredded vegetables, ketchup, mayonnaise, and a couple mystery gooey chunks. The worst pizza in my life, but the best tasting food in a week since it was something new. Apparently they thought I had a love affair with apple juice because every day more jugs showed up. one girl from their family was my favorite. She spoke some english and was always the sweetest to me. When I was in pain she gave me back and head massages. After over a week with no shower and lying in a bed, my hair was a birds nest. I had some big dreads starting in the back. The cleaning ladies had given me one nice wash, but didn’t get any of it untangled and it only got worse. A couple days later my girl and a couple of the cleaning ladies put in some serious work washing and conditioning my hair, but said they would need to cut it. I begged her to try and save it, and she spent almost two hours with a comb untangling everything strand by strand. She was the best and helped keep me positive through it all. 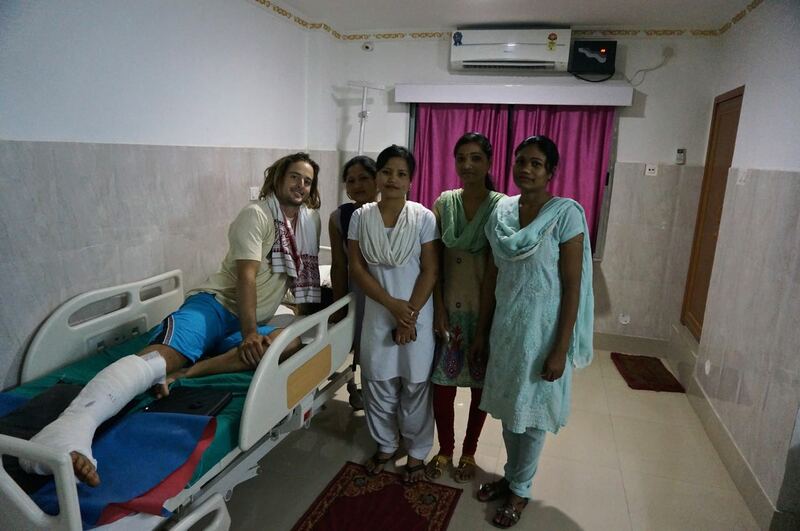 While the family babied and nourished me, I had nurses who took care of me round the clock. 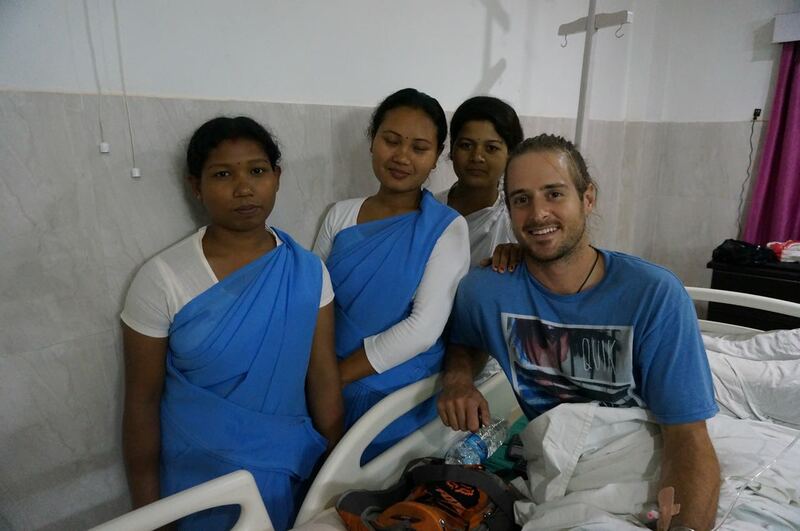 They were my sisters (dedes in Assamese language) and were the highlight of my time in the hospital. I loved all of them. I had ten main dedes who worked in shifts. There was a morning group of three who I always started my day with, an afternoon crew of four, and a night shift of three. I loved waking up to their smiley faces first thing in the morning. I could have gone without the needles and injections for breakfast. Unfortunately my IV kept getting clogged after a couple days so I ended up having seven different ones. Four in my left hand and arm, and three in the right. They were constantly pumping me full of something. If I wasn’t getting medication, it was saline solutions, which made me pee non-stop. The shift change in the afternoon was always exciting because I had more nurses to tease and joke with. The afternoon girls and I always had a lot of fun. They might have been the sweetest and we goofed around a lot. The nurse in charge in the afternoon always wore the cutest little hat on the back of her head. She was shy and I loved getting her to laugh and teasing her because I knew she was trying to be serious. Another one had the prettiest lips and eyes and I was always excited to see her each day. The third one was the kindest and most gentle dede I had. She spoke some english and we developed a good friendship. We had tons of laughs together, but what made the afternoon the best was the cleaning lady. She might have been goofier than me. After getting over her nervousness from the first white guy she had ever seen, she was a comedian. 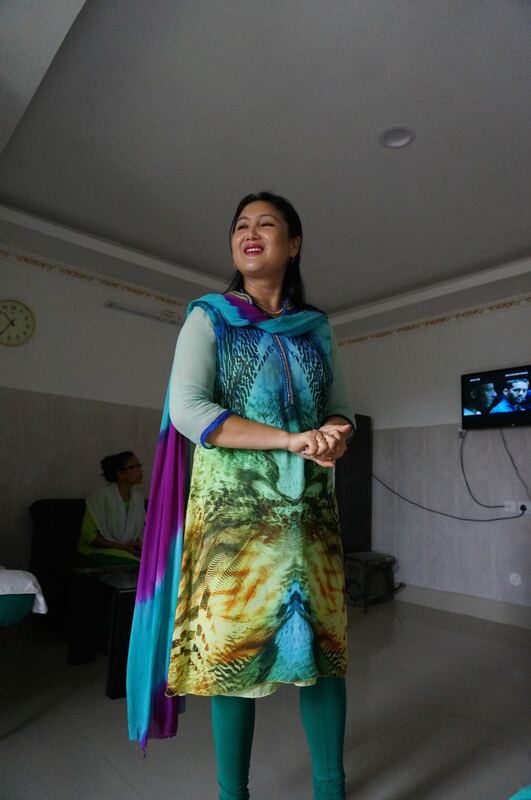 She would do Assamese dances for me all over the room in between cleaning the floors. Her awesome energy helped me heal. As soon as I was able to hop around on one leg, I was up dancing around with her. At eight in the evening my night shift arrived ready to poke and prod at me. One thing that was strange to me was how the nurses took my blood pressure all day long. Every hour or so throughout the day they would come in and do it. I started to feel like they did it just to touch me. My night dedes were the best too. The night time can be the loneliest in a place like that, but we kept each other entertained. They had a little bit of english so we could talk. They all had their own sweet personalities, and we were a happy little night time family. During most of the day, the nurses had a lot of other stuff to do so they were in and out, but these ones could just hang out. We would take pictures and watch movies. Ill never forget all my dedes at the hospital and the silly times we shared. 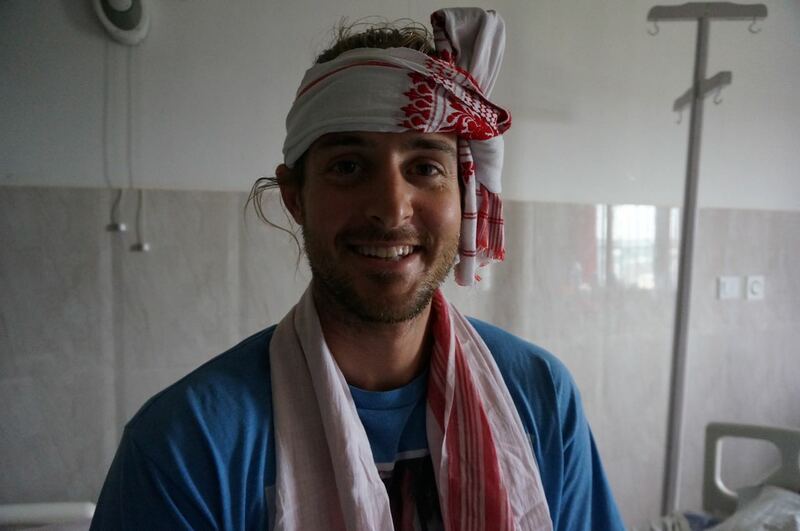 This entry was posted in adventure travel, crash, hospital, locals, Motorcycle world travel, NE India Travel, Photography, travel friends and tagged adventure, assam, dedes, friends, hospital, India, injury, motorcycle crash, ne, nurses, survive, travel, true, world. Bookmark the permalink. Excellent photos – it feels like I’m in the ward too! 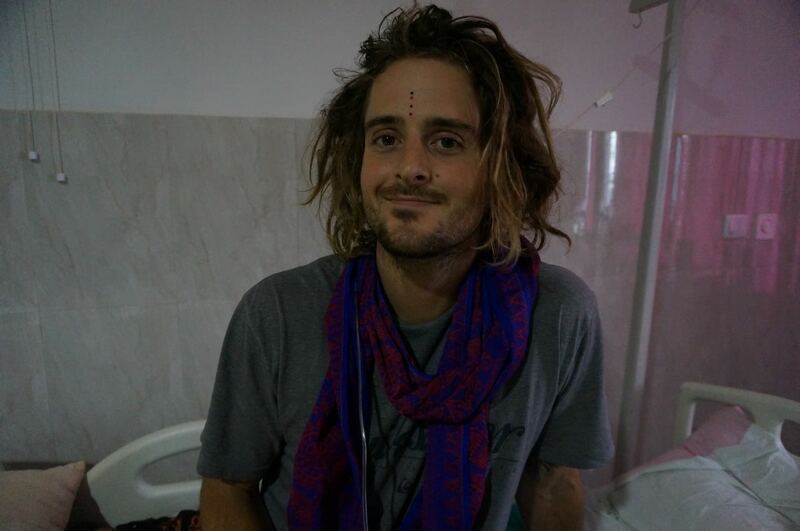 I know what it’s like to be ill when solo travelling in India, though my experience was very minor compared to yours (I had a bout of sickness). Going off Indian food strikes a chord. I love it usually, even just rice and dal, but when ill and also recovering I either wanted nothing but oranges or a few crisps from a packet (I think my subconscious wanted only ‘sealed’ foods); or I started dreaming of cheddar cheese and lettuce baguettes. My brief experience of the health service was positive, even if I was disconcerted at first because lots of people were milling around the room, my privacy only secured by half-closed curtains, while I was explaining my symptoms to the doctor. He kindly gave me his mobile phone number, in case I needed further help. Hey Jasper, thanks for the feedback. I agree, I also had positive experience. Especially how small my total bill was. If it happened in America I would have been bankrupt. Was just a bit overwhelming at times. Haha I also usually love indian food, I’m just starting to like it again now. I checked out your blog, I enjoyed the doing yoga on church property. Good stuff.